« New Online Multiplayer Mode in Splendor! If you feel like traveling, you will also have the opportunity to give the next installment in the Ticket to Ride game series a go: Ticket to Ride Rails & Sails adds boats and harbors to the mix and leads you to the Great Lakes Area or on a full fledged trip around the world! Quadropolis will take part to the party as well. Walk a few steps in the shoes of a City Mayor and build the city of your inhabitants’ dreams! If you’re a player already, don’t miss the opportunity to grab a few goodies tiles on our booth. 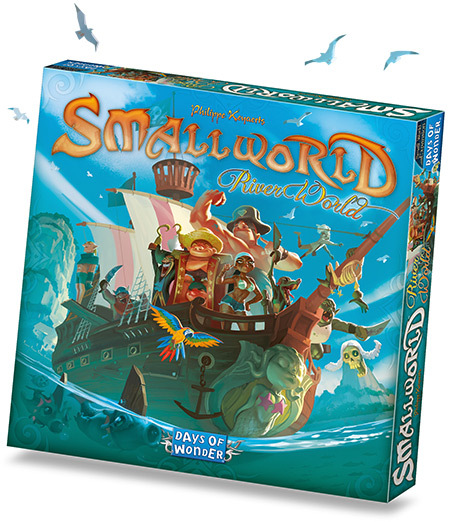 If you are in Essen, make sure to visit us at the Days of Wonder booth and to check the schedule as Philippe Keyaerts (Designer of Small World), Bruno Cathala (Designer of Five Tribes) and Miguel Coimbra (Illustrator of Small World) will be present at some point on saturday to chat with you and sign copies of their games! We will be located in Hall 3, Booth 3B107. 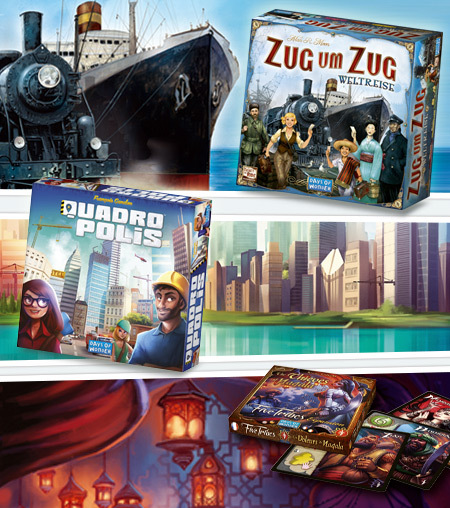 Our games will be available for sale from the Asmodee Store right across the alley (Booth 3B108). This entry was posted on Tuesday, October 4th, 2016 at 11:15 and is filed under Big Adventure Games, Events, Games, News, Small World, Ticket to Ride. You can follow any responses to this entry through the RSS 2.0 feed. Both comments and pings are currently closed.